Shoreline Area News: More than a million - How far can you walk Shoreline? More than a million - How far can you walk Shoreline? Shoreline’s Million Step Challenge is starting May 1 with some exciting changes and a new community goal of 30 million steps walked during the month of May. The Million Step Challenge is a free, month-long event that invites people of all ages and abilities to walk as much as they can during the month of May in the name of health, fitness, and friendly competition. Participants compete against each other for prizes, as well as working together to reach the 30 million step community goal. The event started in 2014 in the Ridgecrest Neighborhood and has since expanded to include the entire city. New for 2018, the Million Step Challenge is introducing a “Neighborhood Challenge” where participants will log which neighborhood they walked in (or live in). The City of Shoreline will track how many total steps each of Shoreline’s 14 neighborhoods have walked awarding a prize to the winner. The goal is to encourage more walking and create a bit of competition amongst the neighborhoods. 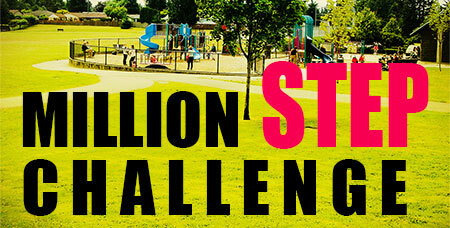 There is no need to sign up or register for the Million Step Challenge. Participants without internet access can log their totals on a paper step tracker located at Paramount School Park, 155th St and 8th Ave NE. Totals will be updated regularly online. There you can see who the current top steppers are and which neighborhood is leading. You can also see our collective progress in reaching the 30 million community step goal. The Million Step Challenge is produced in partnership between the City of Shoreline and the Ridgecrest Neighborhood Association. We want to thank the North City Water District for sponsoring prizes for the event. You can find more information online or contact Recreation Specialist Marianne Johnson at mjohnson@shorelinewa.gov or 206-801-2600. Join us at the kickoff, meet fellow walkers, and have a chance to log some early steps. The whole community is invited to a potluck in celebration of Million Step Challenge. Prizes for participants and awards for top three steppers presented. Bring a potluck dish to share. Beverages, plates, and utensils provided.